RSO’s recommended contract values: Top left corner, by the player’s picture (values assume standard league settings: 10 teams with 20 player rosters, 2 Rookies acquired through a Rookie Draft, 1 four-year contract, 2 three-year contracts, and 3 two-year contracts). Click this link to see a list of our recommended contract values for the NFL’s top players. Player intelligence software that acts as the Player’s Agent, instantaneously fielding and valuing contract offers from up to 32 owners. Each time a new offer is made, the offer buttons automatically update and progress to the next set of available contract offers (for 1, 2, 3, and 4-year contracts) that a player values greater than the “Current Offer”. Offer buttons display the length, total amount, guaranteed amount and 2013 salary of each contract offer. The ability to jump the market by making a “Manual Offer” of any length and value greater than the current offer. A Personal Queue that allows fantasy participants to store and nominate specific players. Detailed contract information for all players signed by any Team Owner, including length of contract, total amount, guarantee amount, current year salary and average salary per year (accessible by clicking on the “i” buttons in the team name boxes on the left-hand side). Automatic Team Salary and Salary “Cap Room” calculations, displaying the amount of money a team spent on player contracts and how much money a team has available to sign players to contracts (Team Salary is displayed next to the team name in the Roster box and the remaining Salary Cap Room is displayed in the team name boxes on the left side). Pause and Rewind buttons that allow the Commissioner to “Pause” the auction for any duration, and to “Rewind” a player signing in the event a mistake was made by one of the Owners. 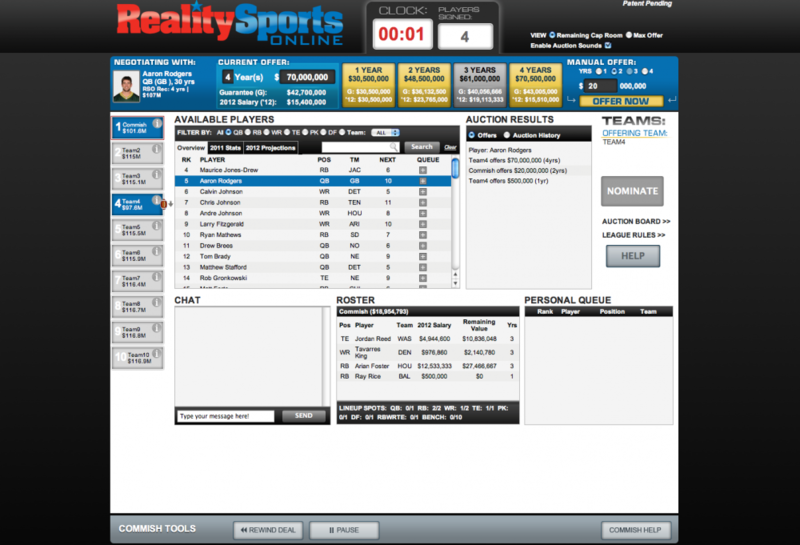 Auction Results box with “Offers” and “Auction History” radio buttons, allowing a Team Owner to display the list of Offers made during the current negotiation, or display the history of player signings during Free Agency in chronological order. An Auction Board showing a breakdown of Player contract signings during Free Agency. View “Remaining Cap Room” or “Max Offer” (radio buttons).